Just as every traveler has their own personal style of travel, so too do they have their own personal style of travel planning – the kinds of information and formats that they prefer when deciding where to go, when to go, and why to go. Some travelers, for example, already know about where they would like to go (a country, a destination) and primarily interested in learning when to go for best weather and what to do once there. Others have a vaguer idea about a region or an activity they want to do. And some are open to anything, and are looking for initial travel inspiration about the entire world of potential travel experiences. 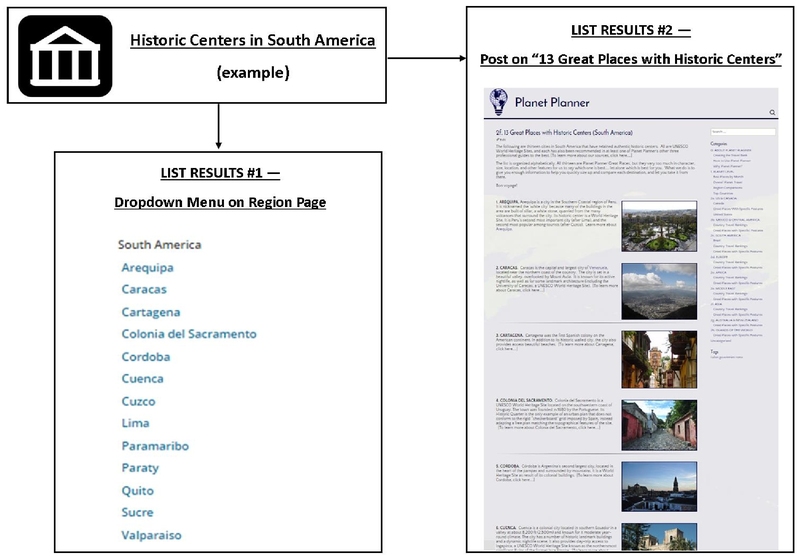 Many travelers use multiple approaches to destination discovery and itinerary creation – reading text about a place, for example, before then looking at photos or maps to learn more. And their approach often changes as they move along the planning process and arrangements become crystallized. 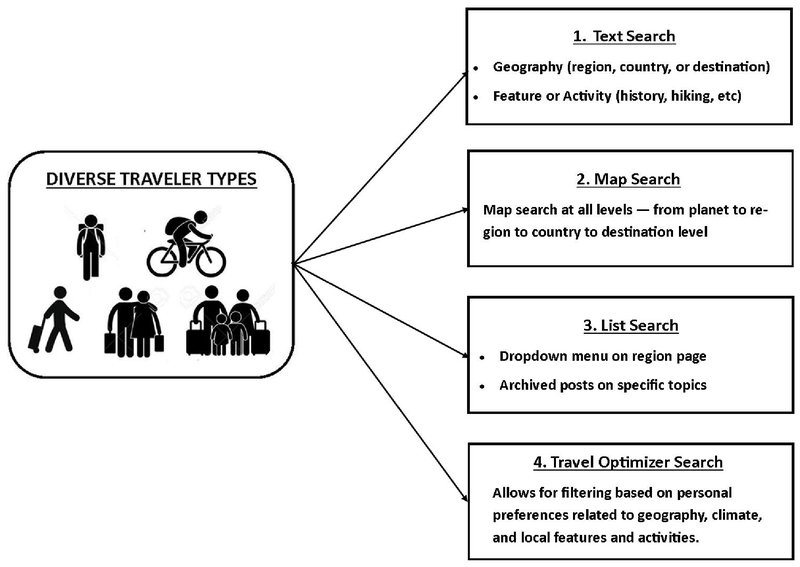 What all of this means is that for a planning website to be genuinely useful to travelers, it has to provide diversity in search methods that matches the diversity in planning approaches for different travelers and at different phases. 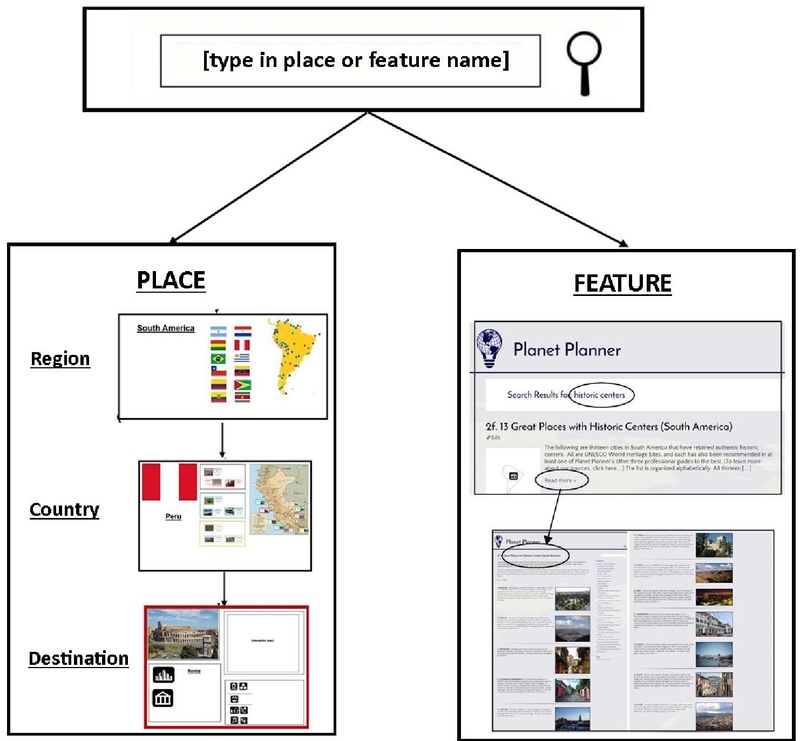 Planet Planner provides four different search methods, each with its own unique advantages. These four options are shown in the figure on the right, and explained below. Places — regions, countries, and specific destinations. Features include words and phrases that refer to destination’s specific characteristics (eg, large city, archeological site, waterfalls), as well as a variety of types of activities that can be done (sailing, diving, hiking, skiing, etc). Planet Planner’s map system operates at the planet, region, country, and destination levels, while the interactive maps at each level allow zooming in and out at finer scale gradations. The website’s map multilevel navigation system provides the traveler with four specific pathways for moving down geographic levels and narrowing in on destinations and countries. Planet map to region map. The first pathway takes the traveler from the home page to the region page, which serves as a “portal” to both countries and destinations. Region map to destination page. This pathway uses the region map’s interactive pin system and takes users directly to destinations in the region that are of interest. Region map to country page. 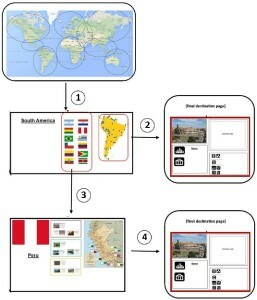 This pathway uses the region map’s interactive country locator system (using Amcharts), and takes users directly to countries in the region that are of interest. Country map to destination page. 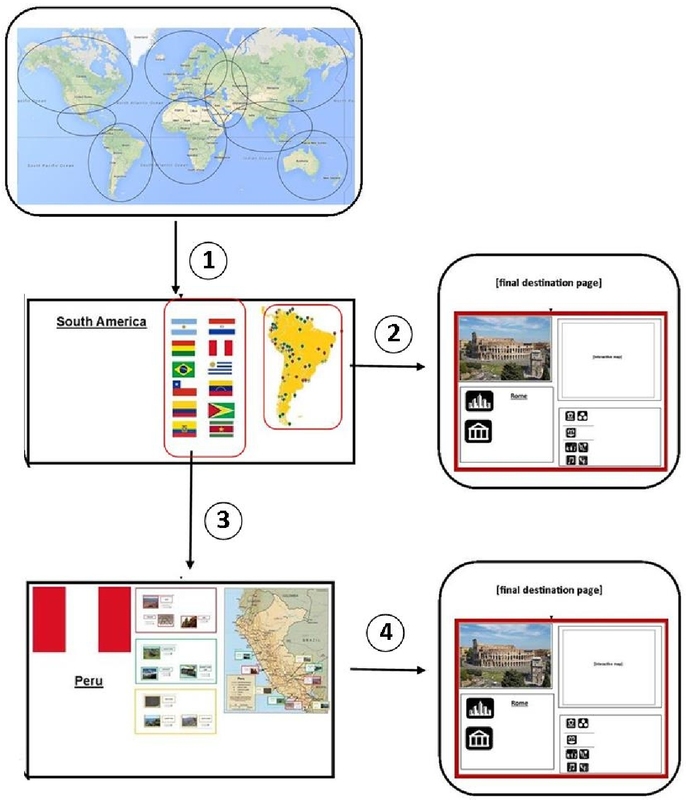 This pathway uses the country map’s interactive [pin / label] system to take users directly to destinations within that country that are of interest. 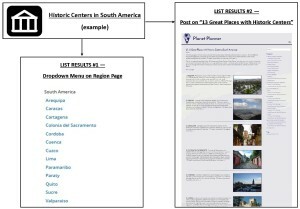 Planet Planner provides travelers with two different types of lists that emphasize various highlighted features — ranging from historic centers and contemporary cities where “culture” is the primary attraction to oceans, lakes, mountains, and outdoor adventure where “nature” is the primary attraction, as well as “hybrid” places in between. LIST SEARCH. This involves a dropdown menu on the region page with region-specific lists of destinations where the clicked feature or activity is a highlighted feature. POST SEARCH. This includes a library of archived posts on specific topics that are handcrafted and then organized within geographic, highlighted feature, and other traveler-relevant categories. 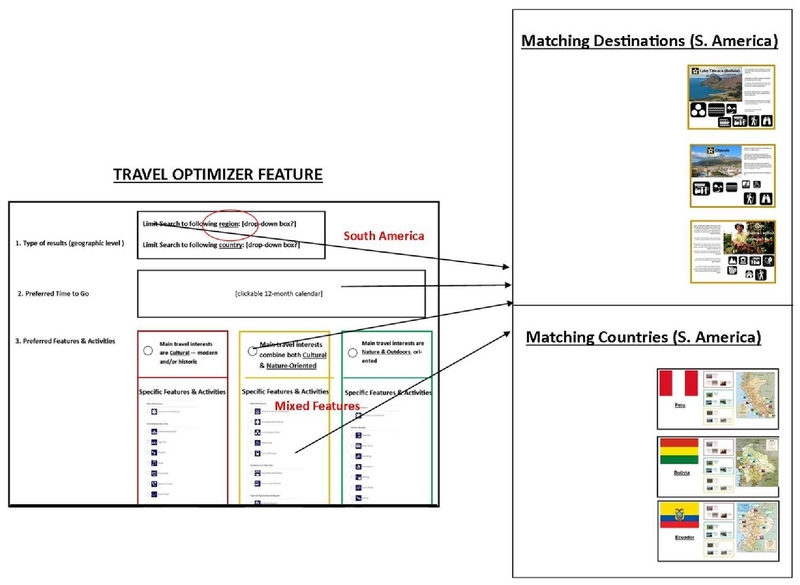 One of the important features of Planet Planner lists and posts that differentiates it from the “Top-X” lists that are frequently used as travel inspiration content is that travelers can click on places that appeal and be taken directly to dedicated destination and country pages with considerably more information. These pages are within the site itself, avoiding the chaos and cacophony of the larger web. 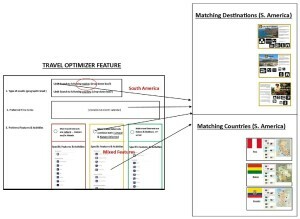 Planet Planner’s unique Travel Optimizer allows travelers to set their own travel parameters to find personally optimized sets of destinations and countries. Our system utilizes filters to screen for personal preferences based on geography, climate, and a diverse range of travel interests. This includes over 40 features and activities, ranging from the cultural and indoors-oriented to the natural and outdoors-oriented, as well as features that combine elements of both.